HABIT: Evergreen multistemmed shrub (semi-evergreen in the North). Height and spread 10 - 15 feet. Leathery, wrinkled leaves are the most distinctive feature. They are a dark green above, a pale fuzzy gray to brownish below and droop from their stems. Leaves have deeply etched veins that give the foliage a coarse appearance. They are 3 to 7 inches long and 1 to 2 1/2 inches wide, oblong, opposite and in pairs. Late spring clusters of tiny ¼-inch flowers form at the ends of branches. Mildly fragrant flower clusters from 4 to 8 inches across and have a creamy white to yellow color. Red berries follow flowers and are enjoyed by songbirds. They last into the winter, eventually turning black. Bunches of flower buds form in late summer for the following spring, resembling a loose head of cauliflower. Buds winter over under the protection of felt-like covers. CULTURE: Easy to grow in shade to part sun - zones 5 - 8. Prefers shelter from wind and winter sun. Can tolerate heavy shade. Moderate to light water and fertilizer requirements. Not bothered by pests and is a vigorous, fast growing shrub that does well in almost any soil, acidic to alkaline. To get fruit, you need at least two genetically different plants to cross-pollinate. They don't have to be the same cultivar, but plants grown from cuttings from the same plant will not work because they have identical chromosomes and genes. Prune, if needed, right after flowering since the buds for next season's flowers are produced in late summer. USES: Excellent plant to use as an evergreen background, border plant or specimen. 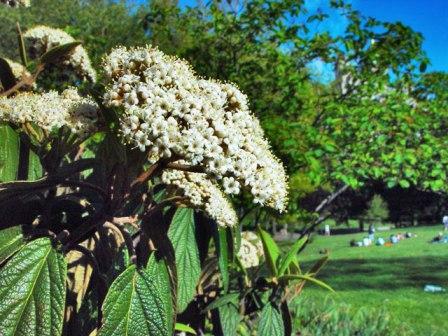 NOTES: Leatherleaf viburnum is native to China, introduced to US in 1900.